Please use the digital object identifier doi:10.6069/H5MW2F2Q in your citation of this index. Updates of this index are not funded. If updates of this index are crucial to your work, please talk to your funding provider about helping to fund future updates. Data as a 2-column table (year, value in cm/month). The anomalies are with respect to 1900-2017. The Sahel rainy season is centered on June through October, and the means are taken for those months. Earlier versions of this WWW page (2008, 2016) provide documentation on the Sahel precipitation climatology and year to year variability. Maps of the climatological African rainfall are also available. 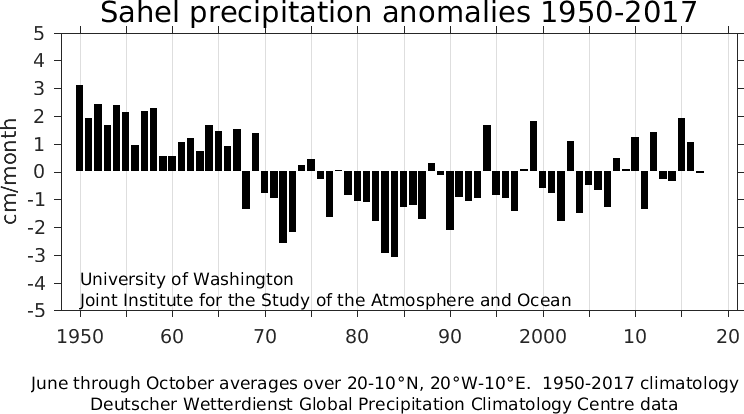 Sahel precipitation was above the long-term mean from 1915 through the late 1930s and during the 1950s-1960s, after which it was persistently below the longterm mean, with the largest negative anomalies in the early 1980s. The anomalies are with respect to 1950-2017 in this figure. The index is calculated from 0.25-degree resolution Deutscher Wetterdienst Globall Precipitation Climatology Centre (Becker et etl, 2013) data. Values for 1901-2013 are from the full data reanalysis and for 2014-16 from the first guess fields. The "first guess" lags the observation time by one month so the October value will be available for analysis before the end of the calendar year. The Sahel averaging region was determined by a rotated principal component analysis of African precipitation (Janowiak 1988). Climate Anomaly Monitoring System (CAMS) Outgoing Longwave Radiation Precipitation Index (OPI) data analyzed by the International Research Institute for Climate and Society (IRI). Rain gauge observations analyzed by the NOAA National Centers for Environmental Prediction Climate Prediction Center (CPC). CPC provides a nice selection of climate observations for Africa. Becker, A., P. Finger, A. Meyer-Christoffer, B. Rudolf, K. Schamm, U. Schneider, and M. Ziese, 2013: A description of the global land-surface precipitation data products of the Global Precipitation Climatology Centre with sample applications including centennial (trend) analysis from 1901-present. Earth Sys. Sci. Data, doi:10.5194/essd-5-71-2013. Janowiak, J. E., 1988: An investigation of interannual rainfall variability in Africa. J. Climate, 1, 240-255. Friedman, A. R., G. Reverdin, M. Khodri, and G. Gastineau, 2007: A new record of Atlantic sea surface salinity from 1896 to 2013 reveals the signatures of climate variability and long-term trends. Geophys. Res. Lett., doi 10.1002/2017GL072582. Frost, L., Mace, D., P. Wraight, and L. Lewis, 2016: Edexcel A Level Y2 Geography Student Book, 978-1-2921-3964-7. Goulden, M., R. Few, L. Abebe, N. Brooks, M. Daoud, M. K. Kanaté, E. Sarney, D. Smith, B. Umoh, P. Vernon, J. Weiner, and B. Yamba, 2011: Climate change, water and conflict in the Niger River Basin. International Alert, London and University of East Anglia, Norwich UK, 70pp. Haywood, J. M., A. Jones, N. Bellouin, and D. Stephenson, 2013: Asymmetric forcing from stratospheric aerosols impacts Sahelian rainfall. Nature Clim. Change, doi:10.1038/NCLIMATE1857. Revise Edexcel GCSE (9-1) Geography A Revision Workbook, 2017, ISBN 978-1-2921-3373-7. Sitch, S. and Drake, F. (2013) The changing water cycle. In Holden, J. (ed) Water Resources: an integrated approach. Routledge. The precipitation index is provided here in several formats. The anomalies are with respect to 1980-2009. A 3-column table: year, month, index value (cm). A 1-column table, with only the index values (cm). A table organized by years and months, with units of 0.1 mm. Averages are in 0.1 mm, so "-5" is -0.05 cm precipitation anomaly with respect to 1980-2009. Same data as a 2-column table (year, value in cm/month).